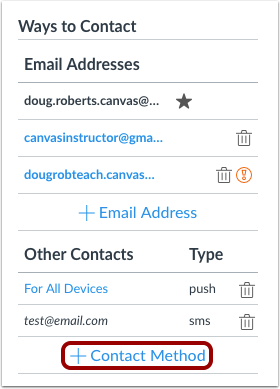 You can add a text or SMS communication channel to receive Canvas notifications on your cell phone. Text or SMS channels appear under the Other Contacts sidebar heading. 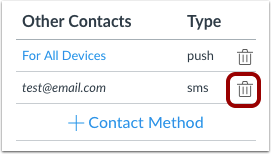 Once you have enabled the contact method, learn how to set notification preferences. SMS notifications are currently available for cellular numbers registered in Afghanistan, Argentina, Australia, Austria, Belgium, Bolivia, Brazil, Canada, Chile, China, Colombia, Costa Rica, Denmark, Dominican Republic, Ecuador, El Salvador, Finland, France, Germany, Guatemala, Honduras, Hong Kong, Hungary, Iceland, India, Indonesia, Ireland, Israel, Italy, Japan, Kazakhstan, Kenya, Luxembourg, Malaysia, Mexico, Netherlands, New Zealand, Norway, Oman, Pakistan, Panama, Paraguay, Peru, Philippines, Poland, Qatar, Russia, Rwanda, Saudi Arabia, Singapore, South Africa, South Korea, Spain, Sweden, Switzerland, Taiwan, Thailand, Trinidad and Tobago, United Arab Emirates, United Kingdom, United States of America, Uruguay, Venezuela, and Vietnam. Standard text message rates may apply. If you have a mobile device and have enabled push notifications, your Canvas profile will include a For All Devices push contact type. If you delete this contact method, the method will reappear the next time you enable the Canvas app on your mobile device. In the Other Contacts section, click the Add Contact Method link. If you are in the United States, enter your 10-digit cell phone number , and select your cell phone carrier . 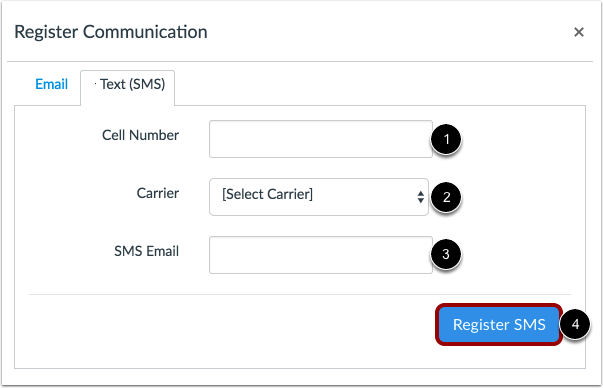 The SMS Email field  will auto-populate your SMS email address. Click the Register SMS button . 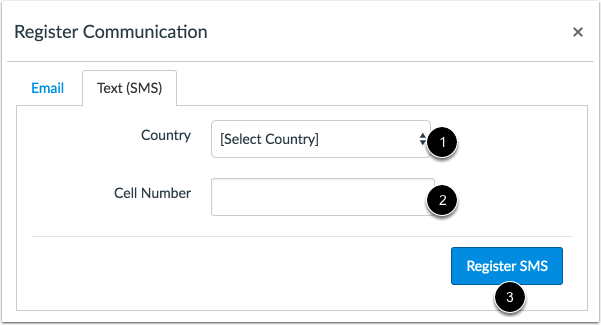 If you're located outside the United States, you may be able to select your country  and enter your cell number . Click the Register SMS button . Note: International SMS must be enabled by your institution. If you cannot select a country, this feature is not available to you. 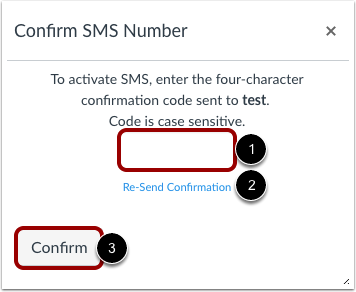 Check your cell phone for a confirmation code from Canvas. Enter the code into the text field . To resend the confirmation again, click the Re-Send Confirmation link . Click the Confirm button . To delete the contact method, click the Delete icon. Previous Topic:How do I reset my password as an instructor? Next Topic:How do I set up multi-factor authentication for my user account as an instructor? 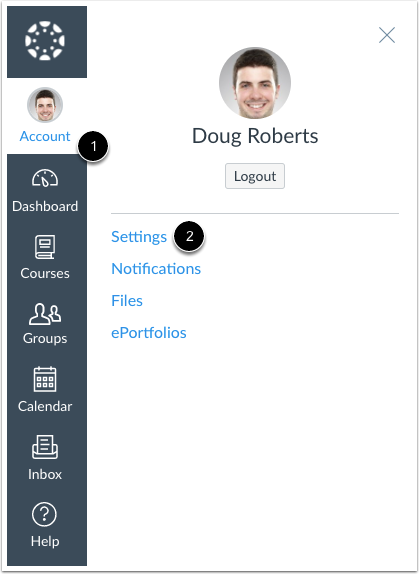 Table of Contents > Profile and User Settings > How do I add a text (SMS) contact method in Canvas as an instructor? Re: How to customize email notification settings? Re: Student comments on assignments - find?